Where can I buy Tribute products? That’s easy! Enter your location here to find the dealer closest to you. 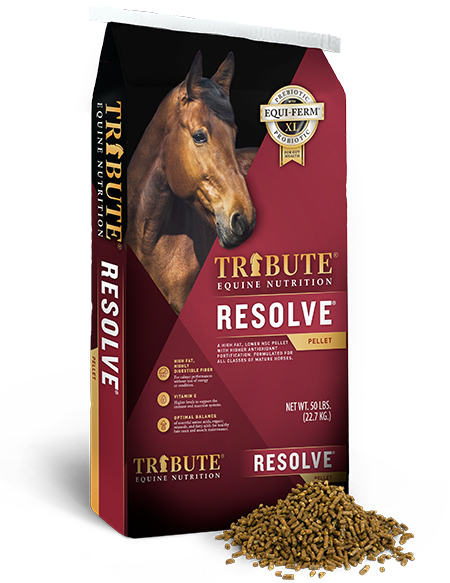 Tribute Equine Nutrition is manufactured only in Upper Sandusky, Ohio. 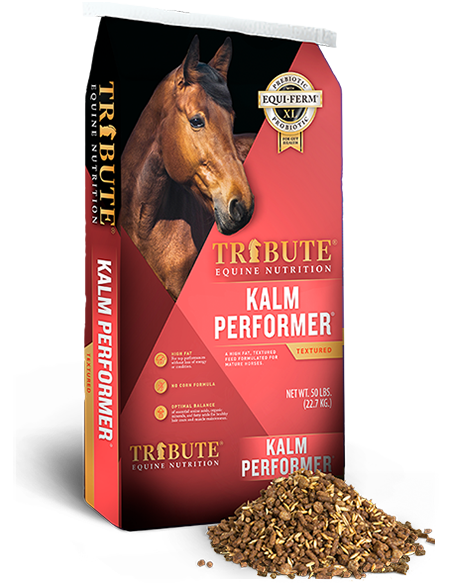 As a brand of Kalmbach Feeds, Inc., Tribute is produced in a state-of-the-art manufacturing facility with emphasis on quality control, fixed ingredients and the highest quality feed you can buy for your horse. How do I become a Tribute Equine Nutrition dealer? Contact us and request that you be put in contact with your local representative. Please include as much information about yourself and your business as possible. What should I feed a horse with special needs? We can help! Please use our Nutrition Selector to get our recommendation for your specific situation. Do you have a low starch feed? What is it? Yes. Check out Essential K® and Kalm ‘N EZ®. “Low starch” should truly refer to the level of both sugars and starches in a product. Both of these products are extremely low in both. We achieve that by providing the calories through fat and fiber, instead of carbohydrates. If you have a horse that becomes “high” or “hot” off of feed, it is directly related to the level of sugar and starch in the product. Choosing either Essential K® for easy keepers or Kalm 'N EZ® for horses that are performing or harder keepers will alleviate this issue. Is Essential K® a feed, supplement, or a “ration balancer”? Both! Essential K® is a “ration balancer,” which means it is a very condensed feed and supplies the nutrients (amino acids, vitamins and minerals) not commonly found in hay or pasture. When fed per the recommendations with a good quality hay, it will meet all of your horse’s nutrient requirements. So, it can be used as either a top dress for horses that need additional nutrients, like mares and foals, OR as a complete feed for easy keepers. 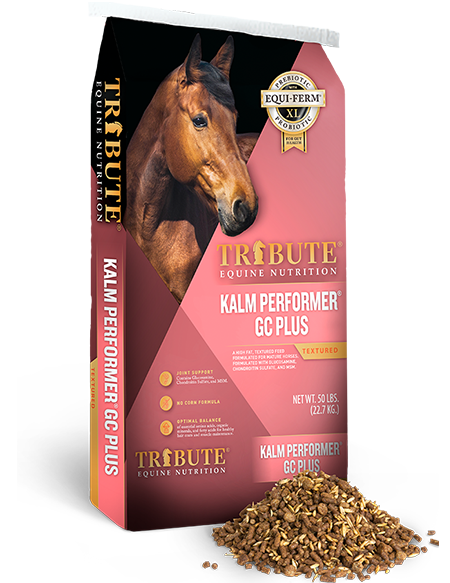 Is the 28% protein in Essential K® appropriate to feed to my horse? YES! Here is why: The horse’s protein requirement in stated as an AMOUNT, not a PERCENT. The percent protein is merely a step in figuring out how much protein is being provided by a particular feed or forage. For example, 1 pound of Essential K® at 28% protein provides 0.28 pounds of protein (0.28 x 1 pound). Two pounds of Essential K® supplies 0.56 pounds of protein (0.28 x 2). For comparison, let’s say we have a grass hay at 12% protein and a horse is eating 15 pounds of that hay each day (like 5 flakes). The protein intake from that hay is 1.8 pounds of protein (0.12 x 15 pounds). This is a lot more than Essential K®! For frame of reference, an idle, mature horse requires a minimum of 1.5 pounds of protein a day, so the combination of Essential K® and the hay satisfies the protein requirement. Essential K® is merely balancing the amino acids and supplying nutrients typically not found in sufficient amounts in hay or pasture. A key factor is that we must consider the horse’s TOTAL DIET when assessing nutritional needs. When should I start feeding my horse a "Senior" feed? 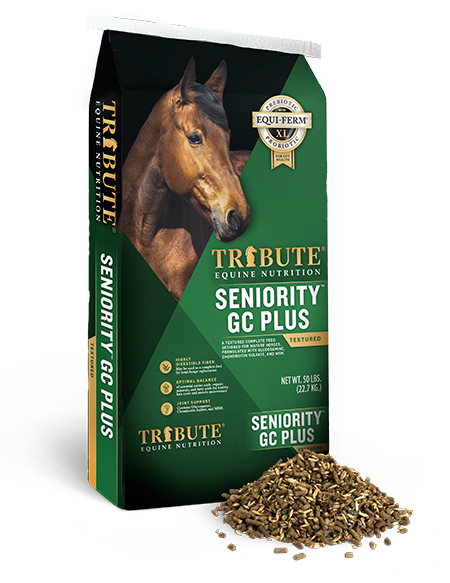 Our Seniority products are made to meet the needs of any mature horse. Most horses are mature by the age of 5. So, anytime after age 5 is appropriate. If your horse begins to experience problems consuming hay, that would be a great time to make the switch to Seniority! My horse has been losing weight recently, has something changed in the feed? You've fed your horse the same product in the same amount for years with great results, but in the past few months you've noticed he's been losing weight. Weight loss without an obvious reason can become common after a drought year. As we always promise that all Tribute formulas are fixed, nothing has changed in our products. What you are likely seeing is a change in the calories supplied by your hay or pasture due. Many folks don’t realize that horses get between 50% to 100% of the calories they need from hay or pasture. When a pasture or hay field is stressed by a drought, all nutrients in that forage, including calories, are drastically reduced. In fact, forage can lose 25 – 50% of its calorie content during a drought or when hay is harvested late due to weather conditions. The only component of forage that increases with a drought or when hay is harvested late, is indigestible fiber, robbing the forage of calories. This is what causes the horse to lose weight. If you think of a horse in light work that typically gets 80% of its calories from good hay. The 40% reduction in calories from hay cause the horse to lose about 32% (0.80 x 0.40) of his calorie supply. These calories need to be replaced by feeding more concentrate or finding a better hay source. We often hear “I buy my hay from the same person every year and it comes off the same field”. We must realize what was stated above is always at play. In a non-drought year, hay harvested later than desired will increase in “stemminess” (indigestible fiber) and cost the horse needed calories. Also, if a field is not fertilized when needed, other nutrients can be lost as well. In a drought year, the growth and nutrient content of forage is affected even more. What “low starch” Tribute product should I feed to my insulin resistant horse? The term “low starch” ignores and important component of the insulin resistant diet – “SUGAR”! The main sources of sugar in the horse’s diet are molasses and pasture or hay. Sugar AND starch need to be addressed. As with all nutrients, we need to consider the AMOUNT of SUGAR and STARCH supplied by a feed, not merely the PERCENT. We call the sugar + starch levels in a feeds “NSC” standing for non-structural carbohydrates. To calculate the NSC INTAKE, we need to multiply the PERCENT NSC by the AMOUNT being fed. For example, Tribute Essential K is formulated to be 14% NSC. At its low feeding rates of 1 to 2 pounds per day. it would supply 0.14 to 0.28 pounds of NSC per day (0.14 x 1 pound or 0.14 x 2 pounds). If we compare this to hay, which is typically about 12% NSC, a horse eating 15 pounds of hay a day would take in 1.8 pounds of NSC (again, sugar plus starch) each day (0.12 x 15 pounds). We must consider the horse’s TOTAL DIET – hay/pasture plus concentrate or grain when evaluating any nutritional situation. My foal has epiphysitis. Is it reasonable to remove all grain from its diet and feed it just hay? This is a common recommendation we run across. The apparent goal is to “slow down the foal’s growth.” In truth, we would have to restrict the foal’s intake by about 75% to slow down its growth and this practice would create numerous other issues. We believe we need to support the foal’s genetic growth rate with proper nutrition. While some developmental diseases are linked to an imbalance of calcium and phosphorous, typically when feeding a hay high in alfalfa, most are due to low intake of copper and zinc relative to the foal’s genetic growth rate. It is NOT related to high protein intake, as many believe. While it is recommended to reduce the foal’s calorie intake, especially from sugar and starch, we actually want to increase the foal’s intake of copper, zinc and the amino acids needed to build strong bone. Using Advance Paste™will improve the foal’s immunity and jump start its copper and zinc intake. In addition, increasing the amount of Essential K® will help supply the needed copper and zinc, as well as supplying the needed amino acids, without significantly increasing the foal’s calorie intake from sugar and starch. What are the Proofs of Purchase for on the Tribute bags? We utilize the Tribute Proofs of Purchase in our Partner’s Program. The Partner’s Program allows clubs and organizations to collect these Proofs of Purchase and turn them in for monetary credit for their group. For complete details on how the program works, click here. I have a nutrition question. How can I get that answered? Please send us an email or give us a call Toll Free at (888) 771-1250 ext. 212. Do you give away coupons? We strive to keep the cost of our products down as much as possible while using the best quality ingredients. Because of this, we don't generally do much couponing. 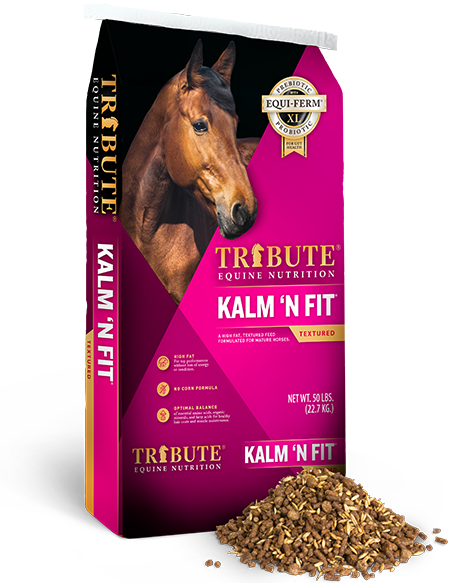 How can I learn more about careers with Tribute Equine Nutrition and Kalmbach Feeds? For more information click here to view our careers page.